I’m writing this post in response to the disaster that I have started seeing in the last few years. The culprit is called Cycad Blue Butterfly. It never used to be like this but in the last few years it has gone to a problem that can’t been ignored. This is a problem for me given that I prefer not to use poisons for my own health. But cycad’s will not survive without a plan on how to care for them. I don’t know how badly they are affected in other areas, in SE Queensland and Nthn NSW it is quite bad, but viewing fact sheets to find out what it was, I noticed that they are also getting attacked there. The problem explained. The cycad blue butterfly attacks the fresh growth as it is unfolding. You have to get onto it as soon as you can. Once it has been affected it will continue to show the ugly damaged growth once it has turned into adult foliage, and is too tough for the young caterpillars to chew. You will notice a huge activity of blue-grey butterflies hovering around your cycad. They leave behind larvae. It is the larvae that will chew on the young fresh leaflets. They also attack the local native cycad species Lepizomia peroffskyana. In this case they will tunnel down the stem of the fresh leaf shoots, further damaging the soft tissue. They are not as extreme with this species, meaning they don’t attack every specimen, but Cycas revoluta the main focus of the butterfly, not one specimen I have seen has been left undamaged. 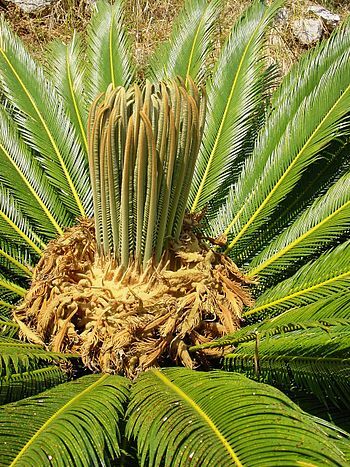 If the larvae are left to attack every flush of growth that occurs on a cycad they can deprive it of the vital chlorophyll the plants need to sustain themselves, and will lead to death. The important question is do you want to see such a stately long lived plant that might be anything from 20 years old, in your garden die. So! 3Litres. The good thing about this is it is a systemic insecticide, so the insect will die both upon contact and also when it chews the leaf. In my case it suits me because I’m not also at that same garden. Other solutions are pyrethrum based insecticides derived from natural chemicals, in this case many insects don’t like plants from the daisy family which include chrysanthemums, and marigolds. At high concentrations as they are made, they are quite effective. They will only kill on contact (not chewing) so you have to spray more frequently. Neem Oil is another natural alternative that has been mentioned that has been known to kill them. In this case spray every 2 weeks, especially when there is new growth. If there is no new growth, spray and thoroughly wet inside the unopened crown of the plant to insure that the next flush of growth get a good start and to kill any larvae hiding there, burrowing into the top of the plant. Otherwise important, is to try to increase the health of the plant. Give it a liquid feed and good watering in dry times to try to produce a new flush of growth. my cycad has no new growth, the centre is very soft and mushy to touch, has been that way for some time, i have sprayed it, no moths are to be seen, can i save this tree, is it in danger? This article is really helpful. I have the caterpillar/moth damaged stems now and wonder whether i can trim them off? I used flyspray daily to kill the butterflies, then eggs, then caterpillars, it helped, but I still lost the new growth. I then used confider tablets, still lost new growth. I tried chilli spray, no good. Despite fighting these blue moths and grubs for years, I can never remember when the new growth time starts, can you tell me? Also, what is the best fertiliser for the cycads to help them?, and should I cut off the stripped (eaten) fronds? Hi Jack, I am in Parkwood and have had the same problem as others. My husband found Yates Rose Gun works a treat !!!! Ours are just all sprouting now and I saw moths yesterday so out came the Rose Gun. We spray each night and it does not seem to burn the plants at all. Hopefully we have hit it early enough so we dont get the damage caused as in previous years. Good luck !! I have noticed that cycads growing near the sea aren’t affected. Is this because of temperature, wind or salt spray? Would spraying with salt solution deter the Butterflies? After trying years of various poisons – to no success, I now just use mosquito netting (queen size bed) & this stops the moth getting in, and no need for poison. Once the new growth is hard enough & moths are no longer interested, I remove the netting. I still remain vigilant to kill any odd moth that does manage to find it’s way in. and also rejig the netting as the new growth gets bigger. The objective is to not let the netting touch the new growth. This has been my approach for the last few years. Much less labour time involved, and no expense on poisons. I have used yates sucess ultra in its lowest concentration. It killed on contact and the eggs. I also use an organic fertilizer Dr Grow it all and have managed to keep new growth. The fertilizer seems to work like a surface spray the moths are not landing now. hi there all, i have started using CONFIDOR, after speaking to a guy who works in our local Bunnings store, he told me to start early in spraying due to the fact the plant absorbs the spray and then excreeds its back out, to keep the blue away, but only in the late of day and stop spraying as soon as the full length of fronds is attained. ours was originally under a tree and i think the microcosm of birds and pests were in balance; the cycad was unaffected when others on our street were, once the tree was removed the moths took over. This year I put a net around mine when the new sprout came and so far it has worked a treat not a moth in sight, last year they distroyed it so I cut it back and just waited for new sprout. it’s the best it’s ever looked at the moment, I just don’t know when I should take the netting down? I sprayed my cycad with neem oil last week. I went to spray again today as we’ve had rain and all the new growth is dried up. Is it possible the neem oil caused more damage than the moths? I have over 30 of the native cycads and its quite a chore to spray every new flush of leaves on both sides. The moth larvae even hatch on one single leaf and will strip in bare if somehow it didn’t get sprayed. I also have 6 the sago palm, cycads revoluta which Im just about to give up on because the moth prefers these. They are a reminder for me to start spraying the native cycads and I usually let larvae have a chew go on the these then spray them. where do these moths come from? i have cycads for close to 18 years and never had problems before some 8 years ago when it started. is this an other introduced species? Hi, I have been using Mortein outdoor spider spray on my cycads and it has been working a treat. I would spray once a week on new growth. It didn’t wash off and stopped blue butterfly larvae in their tracks and had no detrimental effects on the new growth – other products I tried made the fronds grow deformed or become yellowed. The active ingredients are Deltamethrin and Imiprothrin. Unfortunately Mortein have discontinued this product. Yates tells me that Yates Success Ultra is the way to go. Has anyone ever used this product? I grow African & Sth American Cycads like Encephalartos ferox and Zamia vasquezii and don’t have a problem with moths, and yet my neighbors Cycas Revoluta are totally destroyed. My advice is keep away from Cycas Revoluta and grow something different. 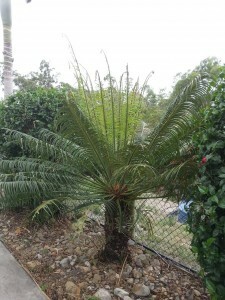 There are hundreds of cycad species available from specialty nurseries in each state. I was told to spray dish washing soap on Both sides ?